The truth is, the stakes are high and the ramifications are significant when you’re charged with a Third Offense OUI. Here’s how to protect your rights. If you’ve been charged with an OUI and it’s your Third Offense, you find yourself in a very different situation than someone charged with a First or Second Offense OUI. A Third Offense OUI is a FELONY that, upon conviction, comes with a minimum mandatory jail sentence. Understandably so, whenever you’re staring down the possibility of going to jail, worries and concerns surrounding your family, your career and your reputation are at the forefront of your thought process. The truth is, the stakes are high and the ramifications are significant when you’re charged with a Third Offense OUI. Your worries and concerns are important to us and they will be put at the forefront of our thought process when we fight your case. While pleading/admitting to the charge is always an option, there is little benefit to doing so on a Third Offense OUI given the minimum mandatory jail sentence required by law. More often than not, if you plea/admit to a Third Offense OUI you will receive the same sentence that you’d receive if you fought the case and lost. If you fight the case and win, upon order of the court, your license can be reinstated subject to the RMV’s reinstatement fee. • 8-year Driver’s License loss. You will be eligible for a 12-hour Hardship License 2 years into the 8-year suspension. If you are granted a hardship license, you will be subject to the Ignition Interlock Requirement. o NOTE: If you refused the Breath Test and have suffered a 5-year Refusal Suspension, the 8-year suspension will run CONSEQUTIVE to the Refusal Suspension and you will not be eligible for Hardship License consideration until after the 5-year Refusal Suspension has run. • If you are issued a Hardship License you will be subject to the Ignition Interlock requirement for the duration of your Hardship License and for 2 additional years when you are granted a regular license. Third Offense OUI If you were arrested and released to appear in court for your “arraignment,” you’re probably wondering what to do and what to expect when you get to the courthouse. The law for a Third Offense OUI is complicated and difficult to grasp. To assist you in understanding what comes with a Third Offense OUI, we have compiled the following summary of potential penalties associated with a Third Offense OUI. We have derived this summary directly from Mass. Gen. Laws ch. 90, § 24—the Massachusetts OUI law. 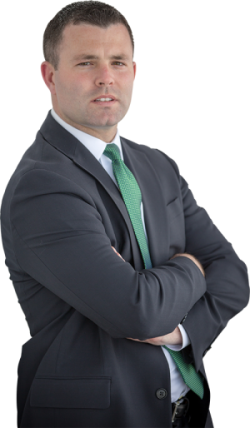 Attorney Higgins is available to speak with you at (508) 930-4273 should you have any questions. Third Offense OUI Penalties: Fine of between $1,000 and $15,000; Incarceration for not less than 180 days nor more than 2.5 years in the House of Correction; Incarceration in state prison for not less than 2.5 years nor more than 5 years if you are indicted and prosecuted in Superior Court. Any period of incarceration cannot be suspended, nor may you be placed on probation, furlough, or be eligible for parole, or receive any reduction in your sentence until 150 days (minimum mandatory) of your sentence has been served incarcerated. Third Offense OUI Fees and Fines: $65/month Probation Service Fee; $250 Head Injury Assessment; $50 Victims of Drunk Driving Fee. Hardship License Requirements: You will be eligible for 12-hour Hardship License 2 years into your 8-year suspension. If you are granted a hardship license, you will be subject to the Ignition Interlock Requirement. After 4 years of your 8-year suspension, you will be eligible for a new license on a limited basis with conditions deemed appropriate by the RMV and subject to the Ignition Interlock requirement. Will I go to jail for a Third DUI offense? If convicted on a Third Offense, yes. A conviction on a Third Offense OUI mandates a jail sentence of at least 180 days, 150 days of which must be served incarcerated. Given this reality, there is little incentive to plea/admit to a Third Offense OUI. Can I get a “Cinderella License" if this is my Third OUI Offense? The Registry of Motor Vehicles does not issue Hardship (or commonly referred to as “Cinderella”) Licenses for Breath Test Refusal or Failure Suspensions. If you refused the Breath Test on a charged Third Offense OUI, your license is suspended for a period of 5 years. If you win your case, upon order of the court, your license will be reinstated. If you lose your case, an additional 8-year suspension will be imposed by the court and you will not be eligible for Hardship License consideration until your 5-year Refusal Suspension has run. When and if you are issued a Hardship License, you will be subject to the Ignition Interlock Requirement for the duration of your Hardship License plus 2 years on a regular license. What is an Ignition Interlock Device? How will this affect me if this is my Third DUI offense? An Ignition Interlock Device (IID) is a handheld Breath Test machine in your car. It is electronically connected to your vehicle’s ignition and requires that you produce a BAC sample of less than .02 in order for the vehicle to start. While you are driving, you will also be required to blow into the machine at random intervals. Anyone who has two or more OUIs is required by law to have an IID installed in any vehicle they own, lease or operate. The IID will be required for the duration of any Hardship License, plus an additional 2 years on a regular license. Will the jury know that this is my Third DUI Offense? No, the jury will not know that you have a prior OUI. In Massachusetts, subsequent offense OUIs are treated in a bifurcated fashion. You will have a trial on the issue of whether or not you are guilty of operating under the influence of alcohol on the date of your most recent arrest. Only if the Commonwealth proves you guilty of OUI will you move on to a second trial where the Commonwealth must prove beyond a reasonable doubt that you are the same person whom, on a prior occasion, was convicted or sentenced to an alcohol education program for a similar or like offense on two prior occasions.